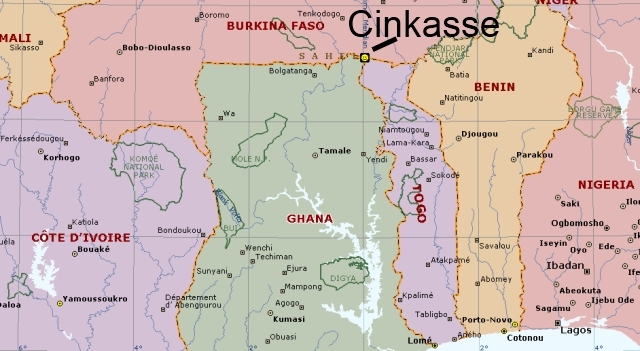 I am in a small village by the name of Cinkasse, Togo; it is located right on the border of Burkina Faso and about 15 kilometers from Ghana. As a person travels, North from the coast of West Africa towards the Sahara the religion turns from Christen to Islamic. "Hey Andy, We wish you would let some of that World out from between your ears and put it in a blog with a fascinating picture or two. love prayers mom dad." I am sure a few of the readers of this Blog can feel my sense of confusion, delusion and apathy with writing recently, maybe this observation of West Africa can explain. I went to a Christen Church here in Cinkasse last Sunday, quite by accident, I truly had no sufficient excuse to avoid, and therefore I accepted the invitation and went. The Church had this interesting rule that men sit on the right and women on the left. "Why, where did this rule come from?" Cinkasse is a village that is 95-98 percent Islamic, and for the last two days they have been celebrating Abraham obeying Gods command to sacrifice his son Ishmael, then at the last moment stopped. Therefore, to understand, I went to the page above and read 12 guidelines of Tobaski, and this is the simple version. 1. Wake up early (before sunrise). 2. Make wudu (ablution) and offer Salat al-Fajr (the pre-sunrise prayer). 3. Prepare for personal cleanliness - take care of details of clothing, etc. 4. Take a Ghusl (bath) after Fajr prayer. 5. Brush teeth (preferably with a miswak, or tooth-stick). 6. Dress up, putting on new or best clothes available (White, when available, is optimal). 7. Apply (alcohol free) perfume (attar) (men only). 8. It is Sunnah not to eat anything before going to Eid prayers. Contrast with Eid ul-Fitr when eating dates is recommended. The sacrifice must be done after Eid prayers to be accepted as sacrifice. 9. Go to the prayer grounds (known as an 'Eidgah') early. 10. Offer Salat al-Eid (the congregational Eid prayer) in an open place, weather permitting, or in mosque. 11. Use two separate routes when traveling to and from the Eid prayer location. 12. Recite the following Takbir which starts at Maghrib (sunset) … etc. I saw a man walking during he holiday with black clothing and instantly I thought of the rules above. I am not sure I understand why God stopped Abraham from doing what he told him to do, this just does not feel to be omniscient and omnipotent. I met the man and two girls on the bus from Lome to Cinkasse, the mans name is Abdoulaye and he says, "Abdou" means "Slave," therefore he is a Slave to God. The other two girls are dancers and his is the manager, but another long story. "The answer to terrorism is education." Well, it appears to me Religions need literate people, on the other hand, the more they read, the less they believe. It is easier to get believer from people who cannot read, than from highly educated and well read people. The more a person reads, the more confused they are, and if they read all the rules above, they would feel guilty when they did not obey. If they do not read the rules, than they are ok, they are just unaware and in peace. This is writing to me, is there a benefit to writing, I cannot just say to myself that having people read what I write is beneficial to their life. I go around and around in my head searching for meaning, and is it ethical to explain my confusion, does this make people happier? I am quite positive, there is no need to read to worship God, in fact, I believe the higher the literacy rate the less people understand a God, good or bad. However, the true problem is this, the more we can read the rules, the more guilt we have, life is no longer simple. Therefore, in reality, writing makes the life of readers more complicated, and I am not sure this is a benefit to humanity, maybe a hindrance. If I dumb it down to the point of absolute clarity, then there is no reason to write. Should I look at readers as smart or dumb? I must continuously suspend judgment on their aptitudes and this is boring. "People need to read to worship God." I did not pay much attention to the name, I have studied enough language to know that names take a punishment due to Transliteration. Maybe I could say, I thought the name was "Lost in Transliteration." "Muslims worldwide to commemorate the willingness of Abraham (Ibrahim) to sacrifice his son Ishmael (Isma'il) as an act of obedience to God, before God intervened to provide him with a ram to sacrifice instead." There appears to be two sons, Isaac and Ishmael, Isaac is the Christian son believed to almost get sacrificed and Ishmael is the Islamic son, there were maybe two sons. Bottom line is it would be easy to just simplify religion or allow people to interpret without reading. Unfortunately not all people will read, instead they continue to believe then always know, and there is no need to read. People want their lives to be complicated, we are programed to seek out stimulation where we can find it -- and if it is not right in front of us, we create it. Why else do the more primitive, further removed, societies on the planet have the tendency to also be the most catty? People need to exercise their minds, or they will start creating their own stimulation. Reading helps to do this. A writer publishes that which stimulates their mind, and readers pick up on it and take it to another place, think about it, start a conversation. The human drama is one of the continuous search for mental stimulation. I travel to do this. There is a reason why old people talk about the weather. A religion allows a person who is a nobody to be a somebody with the least amount of work. The Islamic relgion does this the best.